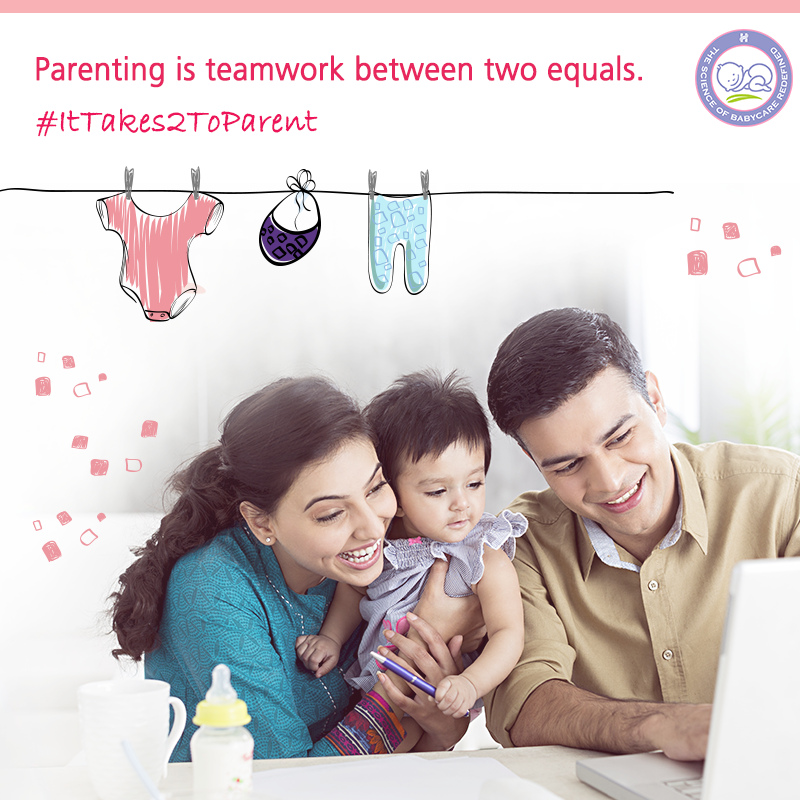 Parenting-a journey of two equals! Gone are the days when bringing up a child was considered to be only the mother’s responsibility. Though there were instances where the fathers would be hands-on dads but in majority of the cases Indian fathers took the tag of breadwinners too seriously and felt it was solely the mother’s duty to take care of the children, come what may! Times are changing, though still a long way to go. Nowadays parenting is shared responsibility of both the parents, just like everything else in a married life! Since the time, the couple discovers that they are going to bring a bundle of joy in this world, both start preparing themselves for the big day and big responsibility ahead. Me and my husband discovered the joy of being parents very early on in life, rather within the first year of our marriage. Though we had an arranged marriage, we both gelled really well from day 1 and so it didn’t come as a “shock” or we weren’t really deterred, rather were happy to welcome our first child early. My husband was more confident that we will be wonderful parents though I was more nervous and jittery than him! Well..13 years back there was no Facebook, mobile was not so prevalent, so we used to read up books together, tried surfing parenting websites whenever possible, went to the doctor’s visit together with in-numerous questions, had tears of joy looking at our baby in the 20th week sonography, our heartbeats would increase with joy every time we heard his heartbeat on the Doppler. Finally, the big day arrived. I had a C-section, so my husband was the first one to hold our bundle of joy. From that day till this day..my husband has been my biggest anchor and strength in bringing up both our children. Not just physically, he helped me emotionally too tolerating my days of depression, anxiety, anguish, anger, restlessness, impatience..he still does! From cleaning meconium-stained nappies, changing diaper (he did much better than I did), to taking care of them while I could rest, to carrying my roly-poly babies and having shoulder pain in the night, trying to calm me down when I get too hyper with the kids, to taking care of them while I would try to concentrate on my “work-from-home” jobs..he has shared every responsibility..and that’s the way every father should be!! Its been almost 13 years that we both have been parenting..raising kids of 2 age groups, 2 genders, but in sync with each other. We have our difference of opinions, but we try to sort those out amicably. Parenting is not easy..more so in these days and times..but when you know that you have a strong partner who is always holding your hands you gain a lot of confidence in the most adverse situations. The kids learn to respect their parents, believe in equality of genders, learn to imbibe good (and bad too!) traits from their parents, emulate them a lot, learn to believe that nothing is impossible if there is love and faith in each other. I still find many disillusioned women who lament that their husband go for vacations while they attending to the sick kids; they are annoyed if the babies cry in the night; they find excuses if they are asked to take care of the kids for even an hour or 2..I wonder why? Mothers are as human as anybody else and also the child is the responsibility of both the parents.. Whether a woman is working or stay-at-home mother, the fathers can ease a lot of tension, bond well with the kids, strengthen the bond with the mother of his children if he accepts from day 1 that bringing up the child is both the parents’ responsibility. A happy wife will be a happy mother and the child will be raised as a happy child. For a healthy and happy family..sharing and caring of both the parents is really important. Previous PostWords Of Encouragement..Next PostImpressionable mind..